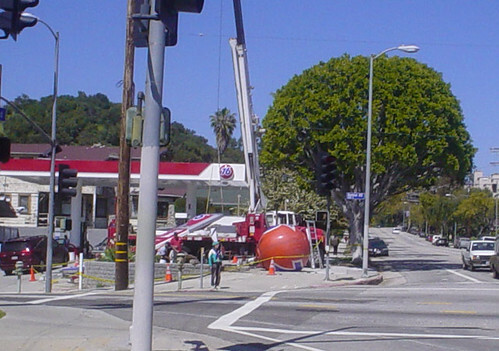 Yes, that is the wonderful spinning ball at Monterey and Avenue 60 in the tiny NE Los Angeles township of Hermon, the same ball featured on the KTLA Morning News’ feature on the Save the 76 Ball campaign. Darleene notes: I’d read about this a couple of times on Franklin Avenue (here, here and here) and later noted to myself, a little smugly, that the 76 station near my house still featured its meatball. 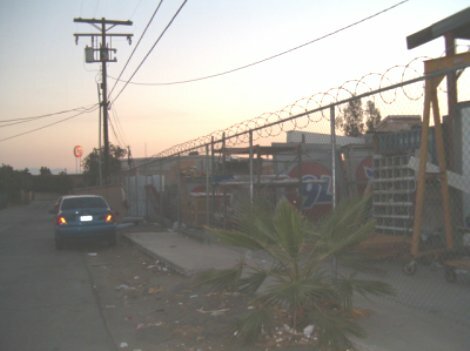 I have to admit I was hoping that this 76 station, tucked into an area of Los Angeles doesn’t feel like Los Angeles, would escape notice, but alas. There goes the ball, sitting sadly on its 6. It’s ironic, as we enter the Easter season, to see this icon of modern design pulled down from its pole… perhaps not such a huge leap to the image of the dead Christ taken down from the cross? Like Christ, we hope our beloved 76 Balls will be resurrected, as ConocoPhillips crunches the numbers and sees that since consumers do have a choice, many of them are no longer shopping where the 76 Ball doesn’t fly. Save the 76 Ball! It’s not too late!